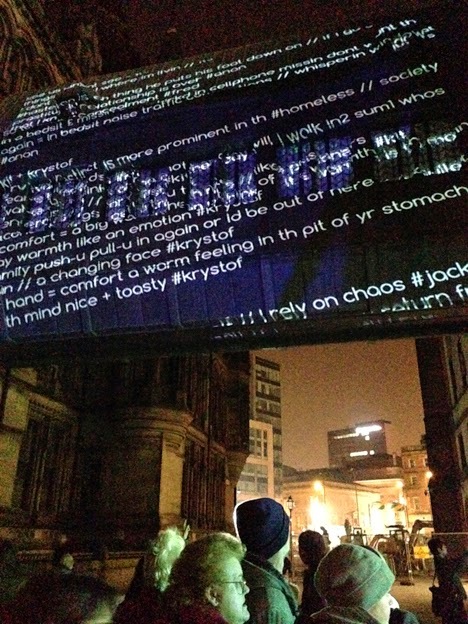 TWEET FROM ENGELS, a long poem written in collaboration with over a hundred homeless people describing their lives, was projected onto the walkway between Manchester Town Hall and Central Library, on the night of 29 March. The projection was part of the Lets Go Global organisation's event Big Digital Project, which gathered together artists from all over Greater Manchester. It was both moving and unsettling, seeing a poem made of so many moments of intimacy become gargantuan. The tweet-size verses are shot through with sadness and confusion - it was somehow shocking to read them scaled up to the size of a building. And yet, how strong they seemed, how honest. Homelessness very often is accompanied by lack of shelter - and many homeless people go to libraries in winter. Perhaps appropriate then that Central Library, a place of warmth and words, should be the site for this work, veiled in this poem. 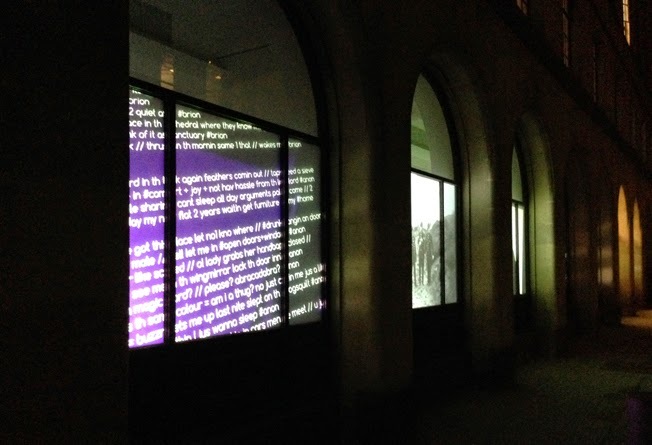 windows, scrolling the poem on a loop. TWEET FROM ENGELS is the first section of the ongoing epic arthur+martha twitter poem ALBION. The second section, made with young offenders, is currently being tweeted from https://twitter.com/tweetfromengels. ALBION is constructed from the voices of marginalised people in the UK, including young offenders, people with a dementia diagnosis, homeless people, and others. This 'chorale' of diverse people has been gathered from arthur+martha sessions over 5 years. Experimental poets in the UK, Canada and the USA including Tom Jenks, Steve Giasson, Geof Huth, Rebecca Guest, Steve Emmerson, and others have helped to edit and tweet ALBION. arthur+martha often use avant garde approaches to writing and art making that allow self-expression and a public platform to people who can be left on the edges. Our work tries to bring the voices and visions of overlooked people into dialogue with wider society. This event is one in a series of arthur+martha exhibitions that have employed large-scale display techniques in public space. We are particularly indebted to Andy Mckeown, Peter Walker and David Harper from externalGalleries who lent their skills so generously to all the groups involved, co-devising and editing many of the projections. We'd also like to thank Naomi Whitman at Let's Go Global and Laura Murphy at Stockport MBC for kind support and advice.